Chorizo and Potato Enchiladas - Muy Bueno! These savory red potato enchiladas are what I would call "Mexican comfort food." The spicy chorizo is tempered by the potatoes to create a very satisfying combo. I keep this recipe simple and use canned red enchilada sauce. I use a sharp cheddar cheese to stand up to the robust chorizo. 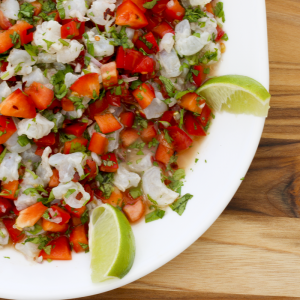 Serve with green onions, cilantro and a bit of sour cream or Mexican crema. The trick is to prepare all the potato enchilada components in advance and set up a nice assembly line when it is time to put the enchiladas together. You will need two skillets – one to fry the tortillas in oil and one to dip the fried tortillas in the red sauce. You will also need a plate to assemble the enchiladas on; a pan for the chorizo and potato filling; a bowl for the cheese; and a 13 x 9 x 2″ rectangular or a 11-12" round baking dish. I like to use a rectangular cazuela, or a round cazuela but a pyrex or ceramic baking dish will also work. I like to make each enchilada individually. That is, I like to fry the tortilla, dip it in sauce, fill it, roll it and put each enchilada in the pan one-by-one. Alternatively, you can fry all the tortillas and then begin dipping, filling and rolling. Do what works best for you. These potato enchiladas can be made a day or two in advance and refrigerated. It will take 10-15 more minutes to heat up if you are starting with a cold pan of enchiladas. If you like enchiladas you might also try my Chicken and tomatillo enchiladas. Spicy chorizo is tempered by potatoes to create a very satisfying enchilada combo. Put the potato halves in a saucepan with 1/2 t salt and cover with water. Bring to a boil, reduce heat and simmer for about 15 minutes until the potatoes are done, but firm and easily pierce with a fork. Drain and let cool. Slip the potato skins off the potatoes and dice into 1/3" cubes. Set aside. In a skillet, heat 1 T olive oil and saute onions with 1/2 t salt, cumin and oregano, about 6 minutes. Add crumbled chorizo and cook stirring until chorizo is done, about 6-8 minutes. Add diced potatoes and cook until the edges of the potatoes begin to crisp, another 5 - 6 minutes or so. Remove from heat and set aside. Put the enchilada sauce in one skillet and place on the stove. Heat on medium low until hot. Reduce heat to very low to keep warm. In another skillet, add about 1/4 cup olive oil and heat to medium high. Ladle about 1/3 cup of enchilada sauce into the bottom of a 13 x 9 x 2" rectangular or a 12" round baking dish and spread it around to coat the bottom of the dish. Heat oven to 350 degrees F. Now you begin the assembly of the enchiladas. Take one tortilla and fry in the oil for about 5-8 seconds on each side. Remove the tortilla from the oil and dip it in the red sauce to coat both sides. Remove the tortilla from the sauce and place it on the plate you will use to assemble the enchiladas. Put about 1/3 cup of the chorizo and potato filling down the center of the tortilla. Top with about 1 T of the shredded cheese. Roll up like a cigar and lay seam-side down in the baking dish. Continue until all the enchiladas are assembled and nestled side-by-side in the baking dish. Pour about 1 cup of the remaining sauce over the enchiladas. Sprinkle the center of the enchiladas with the remaining cheese and bake for 20 to 30 minutes until heated through and cheese has melted. 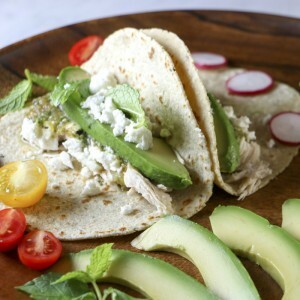 Garnish with chopped tomatoes, cilantro leaves, green onions and Mexican crema or sour cream. I made this last night and it was a hit! We love enchiladas and will be using this recipe over and over. Made exactly as written. 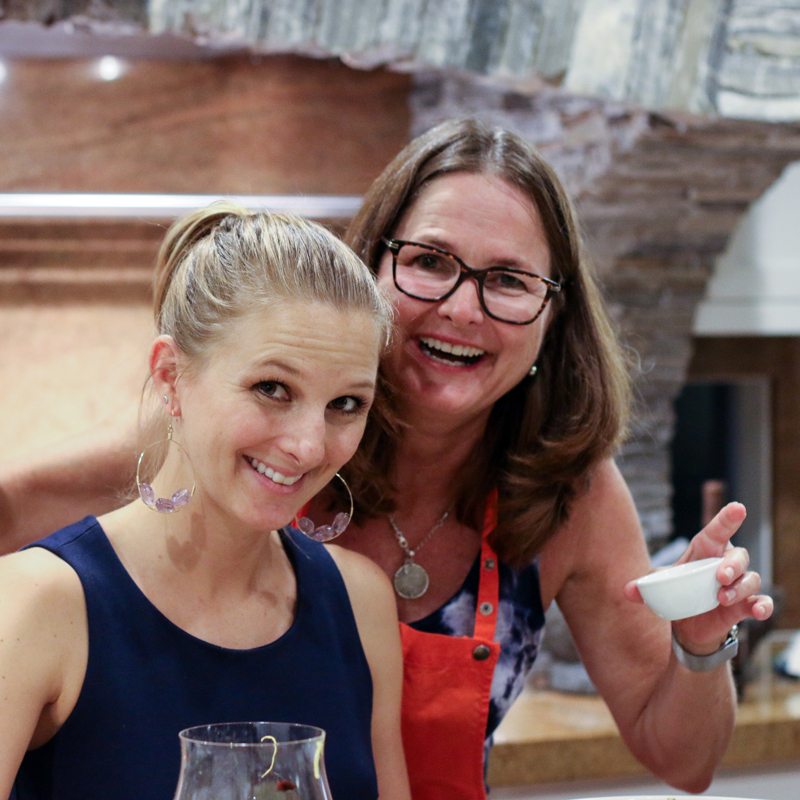 I love your site and can’t wait to try other recipes. Thanks!!!! Thank you so much Katie. I am so happy you enjoyed them. 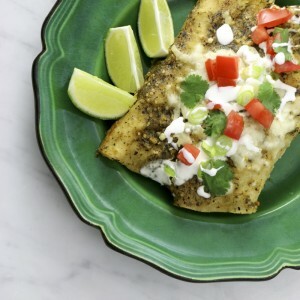 If you like enchiladas you might try my Chicken and Tomatillo Enchiladas. They are good too! Taste like the enchiladas my mother used to make, only difference is she would add a can of drained young small peas. Love this. I am so glad you enjoyed the enchiladas and am very honored that they reminded you of your mother’s recipe. The combination of chorizo and potatoes makes for great comfort food. The peas would add great color. Thank you for writing in! 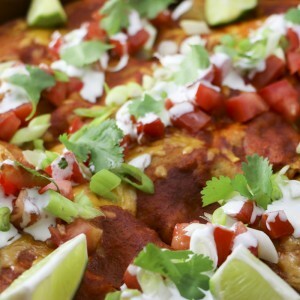 If you like these enchiladas you might also like my They are a little lighter and very tasty! I’m going to be using Trader Joe’s vegan chorizo and vegan cheese for the vegan side of the family. Can’t wait to try it. It looks amazing. Hi Robin, I’ve heard good things about TJ’s vegan chorizo. I’m a meat-eater, although a somewhat apologetic one. Please write back and let me know how it turns out. I am sure there are a lot of readers who would be interested in this vegan variation! Everyone loved the vegan enchiladas. I bumped up the potatoes because Trader Joe’s vegan chorizo was only 12 ounces. I made a trip to Whole Foods for the vegan cheddar and sour cream. It turned out great. It’s a great recipe and very easy to switch over to vegan if you need too. Thanks for the recipe. 350 Degrees F. Sorry about the omission. Recipe is updated.